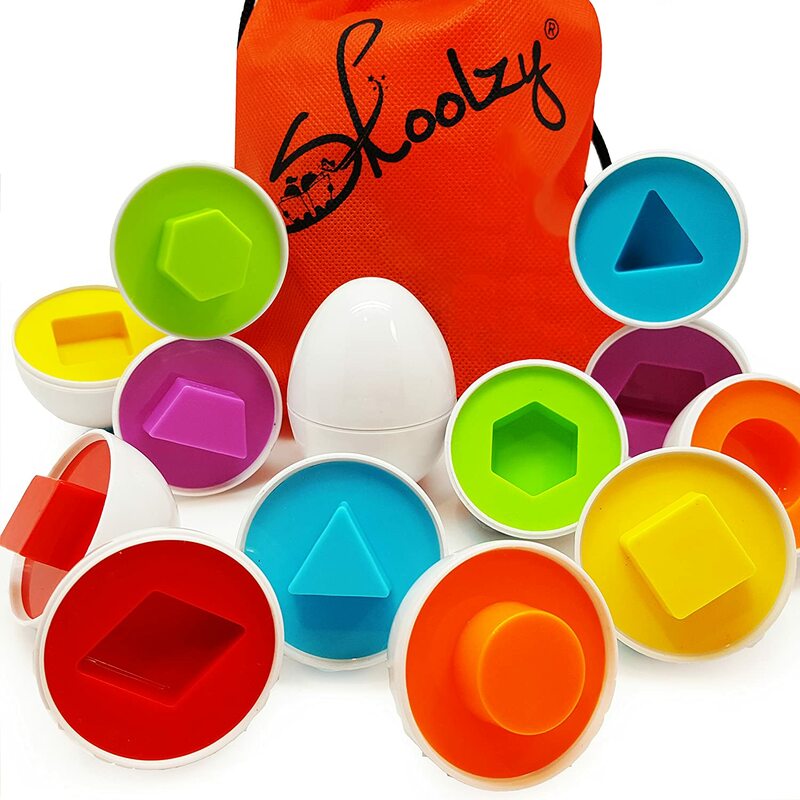 ★★★☆☆ The eggs aren't skoolzy brand. The listing is a bit deceiving BUT the eggs are still decent. They are a little hard to open back up once put together, but I'd rather that than ones that don't stay shut. Would have rated them a 5 had the listing reflected that you are only getting a skoolzy bag with a different brand eggs. ★★★★☆ My wife went a little nuts and purchased a bunch of educational toys for our son who is almost 2 yrs old. Of all of them, the eggs are the ones he plays with most. He is learning shapes and colors and loves to have us pull them apart, and he can put them back together. That's pretty much the only drawback - they are really hard to get apart, even for an adult. The bag was also a little cheaper than expected, and the printed logo had leaked through to the other side of the bag. But the product itself is nice. ★★★★★ This was a gift to my granddaughter when she turned two. She is fascinated with these colorful fun eggs. The colors are brilliant and the shapes challenge her tiny hands to get them back together at which she is becoming quite adept. Some of the shapes are out of the ordinary found in shape matching toys such as the arrow and diamond shapes. These eggs keep her busy for extended periods of time and she plays with them every day. I am very happy with my purchase of these eggs and my granddaughters reaction to them. ★★★★★ I purchased this for my 2 year old son for Christmas. He absolutely loves it! Matching the colors and shapes really keeps him busy - plus he is learning at the same time! Win win! Awesome toy at an unbeatable price. Definitely recommended!